The Story of Tŷ Hapus traces a year in the life of a remarkable place in Wales – the only centre of its kind in the whole of the UK which caters for younger people with dementia. Before I delved deeper into the subject I had the assumptions many of us hold – that Alzheimer’s and other forms of dementia are an old people’s disease. But the real picture hit home powerfully when I learned the youngest referral to Tŷ Hapus was a mother of 44, the same age as me. The presenter of our two-part series – Fiona Phillips - knows only too well how this incurable, degenerative and terminal brain disease can strike younger people. Her mother developed it in her mid-50s – one of the 15,000 people in Britain who show symptoms before the age of 65. Fiona, whose family roots are in Haverfordwest, lost her father to Alzheimer’s too. So when she was asked to become patron of Tŷ Hapus, Fiona felt an immediate connection with the people behind the project and was impressed and encouraged by their aims. “When I got involved I met two remarkable Welsh women who are each making a major impact on how we should cope with and combat this cruel disease,” Fiona explains. The women Fiona describes are Justine Pickering and Professor Julie Williams. I shaped the series through their perspectives. Justine’s mother Annie developed Alzheimer’s at 55. As the disease changed this vibrant former civil servant into someone who required round the clock care, Justine was distraught to find how little provision there was for younger people with Alzheimer’s. The only respite centre available catered for the elderly, leaving Justine’s mother feeling unhappy and isolated. So Justine decided to do something about it. She began fundraising – initially persuading a group of friends to embark on a sponsored cycle from Windsor Castle to Cardiff Castle. Her campaign took flight. What started as a modest plan to fund a single respite care worker for her mum grew into a major project to provide a pioneering day centre for younger people with Alzheimer’s. Justine took a lease on an Edwardian building in the middle of Barry and, begging favours from interior designers and furniture stores, transformed it into an elegant home from home. Complete with cafe where family and friends can drop in, beauty treatment room, dining room and lounge, the ambience of Tŷ Hapus is more boutique hotel than day centre. 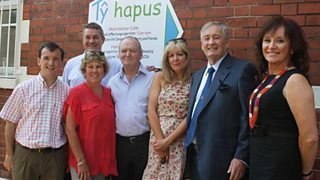 With the help of the Alzheimer’s Society an expert team of carers was put in place and Tŷ Hapus welcomed its first guests at the start of 2012. Providing respite care and activities for up to five days a week, it is a ground-breaking concept. Funded entirely by charitable donations, Tŷ Hapus has proved an absolute lifeline for families struggling to cope with the devastating impact of early-onset dementia. And sadly there is nothing else like it in Wales and the rest of the UK. There must be so many families desperate for similar facilities. Just a few miles away the quest to find a cure for Alzheimer’s continues. Professor Julie Williams and her team at Cardiff University are at the forefront of global Alzheimer’s research. They collaborate with scientists across the world. And with a database of 100,000 dementia case studies to draw on they’ve made some remarkable breakthroughs. “There are new ways of looking at the disease and new avenues for treatment. If I can see just one treatment come out in my lifetime I’ll be very happy,” says the Merthyr-born scientist, who is also a patron of Tŷ Hapus. Julie and Justine just happen to be good friends - Julie’s husband is head of communications for the Welsh Rugby Union (WRU) while Justine is married to WRU chairman and former Wales captain David Pickering. Their involvement with Alzheimer’s has brought them even closer. Together these two Welsh women are making a significant impact on a disease that is expected to affect one million people in the UK in less than 10 years. As Julie concentrates on a cure, Justine aims to improve how we care for younger people with Alzheimer’s. Her dream is to see a concept she created to help her mother Annie benefit thousands of people with early-onset dementia across Britain. The Story of Tŷ Hapus is produced by Carolyn Hitt and is a Presentable production for BBC Radio Wales. The first programme is available on the BBC iPlayer. Programme two, which features a visit to Tŷ Hapus by Sir Graham Henry is broadcast on Sunday 3 February 2013 at 5.30pm on BBC Radio Wales.